This should be good news for Kiulu folks. 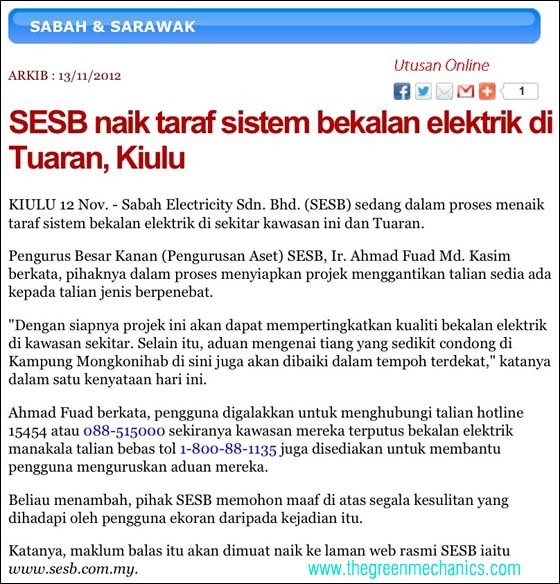 Utusan Malaysia reported that SESB is in the process of upgrading the power supply system in Kiulu, among others include replacement of existing bare cable to the insulated type. I presume ABC cables for distribution. Last year SESB aimed to supply power to at least 95% of the state population by the end of 2012 and as expected, it was warmly welcomed by the rural folks. I was in touch with the People's Development Leader (Kiulu) earlier this year and one of the reason some of the villages not supplied with power is that the existing overhead lines were already overloaded and needed to be upgrade. I took his word at face value. Let's hope the upgrading exercise will then enable SESB to fully supply to this area. Kg Bambangan Baru, 2km from Ranau (old) main road. I understand that consultants and SESB personnel have visited, estimated and gave a good-to-go confirmation to the relevant government agencies. What is so difficult with the implementation? Why the overlook? Tapi okay lah, you are very close already!